The Elgin Marbles returning to Greece wouldn't have created as much stir as the announcement this week that Tullamore Dew is returning to Tullamore. William Grant & Sons, owners of the brand since July 2010, are investing €35m in a brand new distillery just outside the town centre, at Clonminch. It has been a tortuous journey for the whiskey which saw it quit Tullamore in 1954, fetch up in Dublin for a short spell, then join with other whiskeys under the Irish Distillers (IDL) umbrella down at Midleton in Cork. The brand - but not the manufacture - was prised away from IDL in 1993 so that, oddly, the No. 1 (Jameson) and No. 2 (Tullamore Dew) Irish whiskey brands are today made in the same stills but sold by competing companies. But I have documented all of this at length before. When William Grant bought the brand nearly two years ago, the speculation began immediately. Who better to spring for a an entirely new distillery than a respected Scottish distiller? It was almost too much to ask for that it might also be located in Tullamore. It looks like it's been there for centuries, doesn't it? I hunted out an old photo of the original Tullamore distillery and it has a waterwheel just like this one. 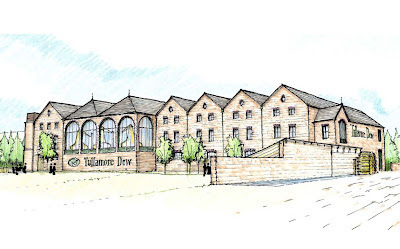 Who knows if the end result will look like this but it's evidence that William Grant is focused on reconnecting Tullamore Dew to its heritage. It might have wandered off for a few decades but it's back and it's not leaving this time. Returning to the press release, I note that the distillery will make both malt and pot still whiskey, triple-distilled. Tullamore Dew has been made to the same recipe since 1947 when the blend was first introduced. It's a mix of pot still, malt and grain whiskeys and I'm sure that will continue. I don't know yet where the grain whiskey will come from. The nearby Slieve Bloom mountains offer "a plentiful supply of natural, quality spring water". One other big question I have is if they will pattern their new pots after the original Tullamore stills which lie silent just up the road at Kilbeggan Distillery. Still shape has a huge effect on taste so I won't be surprised if the whiskey changes noticeably once the switchover happens. Tullamore Dew sells almost 700,000 cases a year, growing at over 15% annually. Credit is due to all who stewarded and promoted the brand over the decades, essentially creating a powerful virtual distillery that William Grant can now make real in copper and brick. That 700,000 cases, of course, come almost entirely from Midleton at the moment. By my very rough calculation, that represents less than 12% of the capacity of that plant, less than 6% when IDL finishes its current expansion. I can't see the loss having too much effect on IDL's other brands. 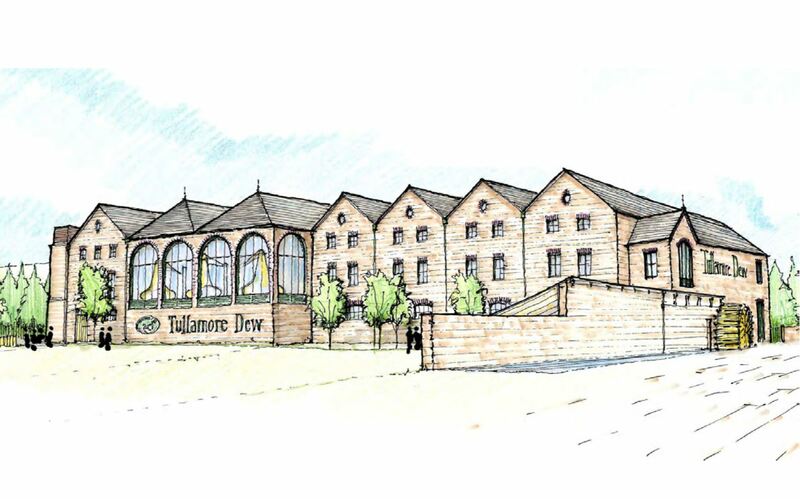 Glasses up to all at Tullamore Dew!